The Zira is more or less a mini version of the Modulus monoWave. 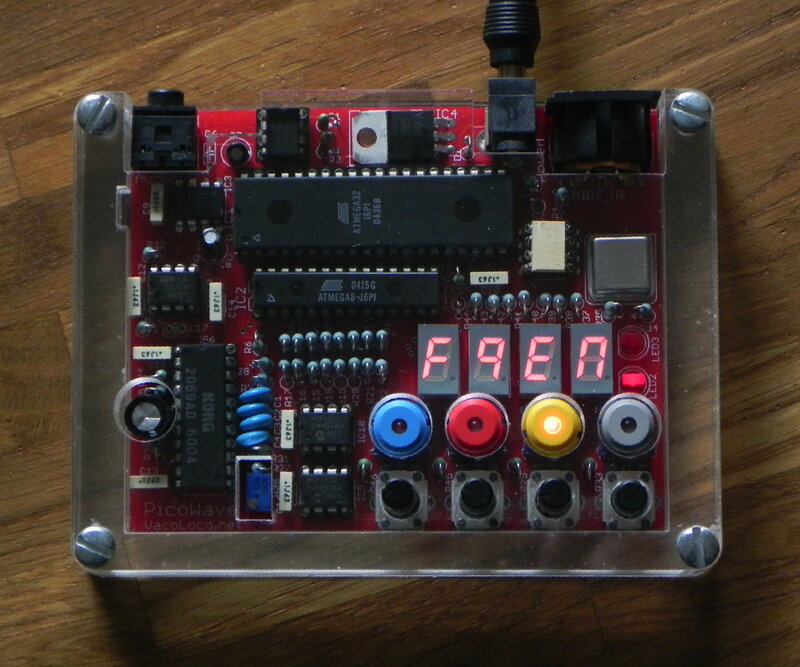 The project by Paul Maddox, the creator of the MonoWave and co-founder of Modal Electronics, was originally named PicaWave (see lower left of the red PCB) and was later renamed to Zira. It got the same two digital oscillators as the MonoWave, but with "only" 48 digital waveshapes. There is one sub-oscillator, hard sync, and one LFO with an fade-in parameter. The discrete ladder filter of the MonoWave was exchanged for a Korg NJM2069AD Filter/VCA chip (as found in the Korg Poly800, DW8000, DW6000 and DSS-1). The envelopes are both digital created. It uses 4 LED 8-segment displays and endless encoders for editing. You can save 64 patches on board. All housed in a clear housing sized 120 x 90 x 24 mm. It got connectors for power, Audio Out and MIDI In. Pushing the blue Load button lets you use the two left hand knobs to select bank and patch, press load again to load that patch, any other button exists load mode. Pushing the red Save button lets you use the two left hand knobs to select bank and patch, press Save again to Save that patch, any other button exists Save mode. Pushing the yellow Edit button takes you through the menus below. Pushing the gray quick button drops you to the quick edit mode, where the four knobs are assigned by the user. These are stored with each patch. The following parameters are accessed by holding yellow EDIT and gray QUICK Buttons together. All parameters are stored per patch (8 banks of 8), except for the globally stored Global Parameters.